Dr. Norbert Müller has done extensive research on Pierre de Coubertin, the Father of the Modern Olympics, and Olympism during his nearly 40-year career as a Sports Science professor at the Johannes Gutenberg University of Mainz in Germany. In honor of the 150th birthday of Coubertin—who many historians refer to as one of the least known great sports pioneers—Müller worked with the United States Sports Academy to deliver an online course celebrating the life and works of the French baron who lived from 1863 to 1937. Müller published the book, “Olympism,” on the writings of Coubertin, the organizer of the first Modern Olympic Games in Athens, Greece, in 1896. In addition, Müller has served as the president of the International Pierre de Coubertin Committee since 2002. He and Academy President and CEO Dr. Thomas P. Rosandich serve together on the International Olympic Committee (IOC) Commission for Culture and Olympic Education. Pierre de Coubertin founded the Modern Olympic Games in Athens in 1896. The Academy’s graduate-level course is being offered this year only for $150 as a continuing education course—“Olympism” (CEB 667). It includes a special rate of $50 on the “Olympism” book that Müller produced and which has been translated into English, French, Chinese and Spanish. However, the book is not required for this course. The Academy’s newest online continuing education course explores Coubertin’s philosophy and values that he instilled into the Olympic Movement and provides historical perspective on the early Games. Today, the Academy is one of few universities in the United States that offers courses on Olympism. It worked with the IOC to first offer courses on Olympism more than 10 years ago. 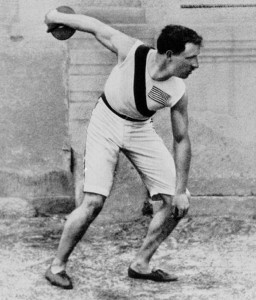 The course on Coubertin is paired with four other courses focused on the Olympic Movement, as part of an emphasis on Olympism that students can take at the Academy at the master’s and doctoral levels. Müller sat down with the Academy to talk more about the university’s Olympism course honoring Coubertin that is available online worldwide. The Sport Digest: We use this quote in our Course Overview: “Olympism seeks to create a way of life based on the joy found in effort, the educational value of a good example and respect for universal fundamental ethical principles.” If Coubertin had observed the 2012 London Olympic Games, do you think he would have felt his vision had been achieved? Dr. Norbert Müller: I think that Coubertin would have been very happy and satisfied with the outcome of the 2012 London Olympic Games. The efforts and preparation of the British population with millions of students participating in the 450 different school programs (i.e. “Inspire-Aspire”), the intensive talent scouting and preparation that led to the success of the athletes of the GB Team, and the fantastic cultural program with 2,000 events in 300 days in 300 cities were truly great. And all this happened on the basis of the traditional British understanding of sport, which has developed over more than 150 years. I conducted a survey with my Research Team “Olympia” in which we interviewed 1,000 spectators during the 2012 London Games. We found that 58% of the participants named commercialization and 57% named the doping problem as the biggest threats to the Olympic Movement in the next 20 years. This not only shows the value-oriented attitude of the Olympic spectators, but also of the British people. Furthermore, Olympic spectators have a much more idealistic image and expectation of sport than for example spectators at a Football World Cup, to whom I have also asked the same questions during the 2006 World Cup in Germany. The Sport Digest: How does the relationship between education and sports today compare with that relationship in Coubertin’s day? Dr. Norbert Müller: An excellent question! In the first 20 years of his work, Coubertin tried to implement physical exercises as “Physical Education” into the French school curriculum. Before this, students were only offered a military-like drill education. English public schools served as the role model for his educational thinking, although he was not aware—and he should have been—of the fact that these were only 25 elite schools. The university athletic programs in the USA, which he witnessed during several study trips from 1889 onwards, also amazed him. This means that he wanted to renew the old ideal of “body and mind” with equal importance placed on human education according to the Ancient Greek example. He regarded the political and economic position of the British Empire as a model of the new education that should be transferred to other “cultivated” countries. Today in 2013, the dominance of the body is very apparent (body cults amongst youth, advertisements, the lack of other values, TV consumption, etc.) and the consequence of this is that we desperately need Coubertin’s understanding of Olympism in order to return to the old balance and harmony between body and mind (fair play, eurhythmy, etc.). 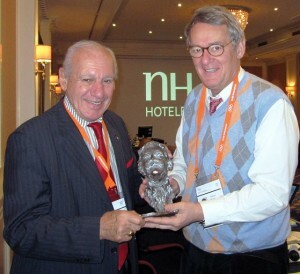 Dr. Norbert Müller (right), a leading Olympic expert, and Academy President and CEO Dr. Thomas P. Rosandich (left) hold a bronze bust of Pierre de Coubertin at an International Olympic Committee (IOC) meeting in Amsterdam in November. The Sport Digest: Do you think Coubertin ever envisioned how big the Olympic Games would become? Dr. Norbert Müller: I don’t think so, but I think he would be very proud that it has come to fruition at such a massive global scale. However, I don’t think he would be happy about the price that the Olympic Movement had to pay for the gigantism, with it being a television spectacle for billions of people as well as a place to stage wars (Cold War). The Sport Digest: In Unit 1, the students read your chapter on “Coubertin’s Olympism.” What are the most important things for them to take from this reading? Dr. Norbert Müller: Critical for this question are my answers to questions 2 and 3. It is that the students understand that Olympism strives to be something very special, something spiritual and eventually an educational concept. An African man from Burundi once asked me if his country should utilize the model of Olympism to reconstruct and unite his ethnically divided nation. This certainly shows a desperate quest for hope, but it is certainly not unrealistic. 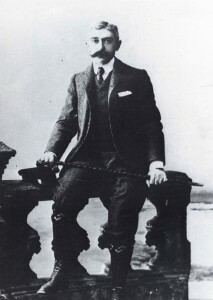 When Coubertin emphasized the freedom of the athlete (“respect mutuel”), he wanted to promote the emancipatory process of young people through sport and Olympism and not their dependence on the sponsors and endorsements. The Sport Digest: The map on page 80 shows that Coubertin visited Mobile, Ala., which is across Mobile Bay from Daphne, Ala., where the Academy is head quartered. During his 1889-1890 trips to North America, were there any special places that he visited in Mobile and did he learn anything of importance during this visit? Dr. Norbert Müller: We can find the answer to this question in his description about his journey to Mobile. Besides visiting the universities in the East of the USA, he also wanted to see an example in the South and, in particular, an example with regards to inter-racial interactions. He also wrote about this in his article “Souvernirs d’Amérique et de Gréce.” However, he finally drove to Mobile because he had an invitation from the Boston YMCA Congress and he was also very much interested in geography. The Sport Digest: In Unit 2, our students are introduced to the Olympic Motto. How do you feel this motto has stood the test of time? Dr. Norbert Müller: At the beginning (1894) the Olympic Motto “faster-stronger-higher” had a very pedagogical intention and, due to its author Father Didon, also a Christian meaning: Try to get the most out of your body and always try to reach your goals. This was as much utilitarian as pedagogical. Already in 1901, in the obituary for Father Didon, Coubertin wrote: “The poor clergyman, if he had known that modern sport always leads to excess.” This is why I much rather use his motto: “See afar-speak frankly-act firmly!” This is also very educational and can be explained very clearly to every pupil or student. Consequently, the International Pierre De Coubertin Committee has put this motto onto the medals for the Coubertin Students Award. On April 5, 1896 in Athens, the first modern Olympic Games kicked off with 241 athletes from 14 nations in the nine-day event. The Sport Digest: In Unit 3, our students read about the Historical Perspectives on Olympism. What do you feel was the most significant event that led to the Modern Olympics becoming a reality? Dr. Norbert Müller: This is really difficult to say! The idea of the modern Olympic Games evolved from Coubertin’s own school education in Latin, Greek and History. The term “Olympic Games” was a synonym for “athletic” in the literature of the pupils. For sure, the Much Wenlock Games, in Wenlock (North England), that were staged since 1850 and were founded by Dr. Brookes, were a very meaningful inspiration and role model. Coubertin had visited the place in 1890 and also met his friend Brookes. But even more than that, the Greek culture and its historical forming influence in Europe were important, especially athletics’ educational mission of harmony (kalos kagathos). Coubertin needed to use the term “Olympic Games” for his world sport festival in order to integrate the somatophobic intellectual world. The Sport Digest: How was the idea of the Olympics as a vehicle for peace affected by the two World Wars? Dr. Norbert Müller: You can write a book about this…Coubertin was too naive and he was always convinced that the IOC and the Olympics have nothing to do with politics. You can take the participation of Bohemia in the Olympic Games in 1908 and in 1912 as a separate team, as a good example. For this he formulated the concept of “Geographie sportive.” But what was the IOC and who was the French Baron Pierre de Coubertin to international politics? Only due to the Olympics in Los Angeles and the attempted Olympic boycott in 1936 did the Olympic Movement become more known and more significant in world political arena. However, how much Coubertin misunderstood or did not pay attention to this, can be seen in his interview from Sept. 4, 1936 with Fernand Lomazzi in the magazine “L’Auto,” where he again stressed the apolitical role of the IOC. We should bear in mind and we should take into our consideration the fact that by that time he was already an old, grey-haired man, who did not want to question his life’s work and passion anymore. The Sport Digest: How do you think Coubertin would assess the “amateurism” of today’s Olympic athletes? Dr. Norbert Müller: He would certainly be in despair, as the professional athletes of today have nothing to do with the holistic education of the body and mind and the leading of a life in which sport should only allow the worldwide presentation of the young elite generation through the Olympic Games (human spring) every four years. The demand made at the 2009 IOC Congress in Copenhagen to protect the Olympic athlete and to create the “IOC Entourage Commission” certainly goes in the right direction, but it is too late. Sports like road cycling should be banned for eight years from the Olympic program to clean up their acts. Football (soccer) should also be removed from the Olympic program and tennis needs to be thoroughly discussed. But the leading powers—FIFA, UCI, ITA—are just too strong. The Sport Digest: Do you have any words of advice for our students studying Olympism? Dr. Norbert Müller: Yes, please recognize the opportunity and duty to preserve the Olympic Movement according to Coubertin’s ideals and ethics not only for sport but also for life in the world of the 21st century and for generations to come. To learn more about the Academy honoring Coubertin with an online continuing education course, “Olympism (CEB 667), read this article, “Academy’s New Online Olympism Course Celebrates the Father of the Olympics on his 150th Birthday.” To register in the course online, visit the Academy’s continuing education page or call 800-223-2668, extension 7162, for more information. Dr. Stephen Butler, who conducted the interview with Müller is the Academy’s Dean of Instructional Design and Technology/Chief Information Officer and can be reached at sbutler@ussa.edu.